Curious as to where most spirit sightings take place in the spirited landmark? There's a list. LETTING THE ATTIC OFF THE HOOK: Any true-hearted fan of haunted flicks knows that there's but a single place where a whole lot of phantom action goes down, or up, rather. It's the attic, the go-to room for the gothic, lurid-lovely scribes of yore and modern fright filmmakers, too. Oh, for sure, we can't argue the fact that cellars are also commonly depicted as don't-go-in-there-alone locations, and you'll probably want to think twice, if you're a character in a murky mansion, of venturing down any long, loooong hallway on your own. (Especially, of course, if there are heavy, foreboding doors on each side of the hallway, leading to who knows where.) We're happy to report, however, that one of the Golden State's most spirited spots, the San Jose landmark that brims with tingly tales, has the whole location-sighting issue sorted for us. Well, at least as far as phantoms and the Winchester Mystery House is concerned. For while other fictional places -- and perhaps non-fictional, too -- have a lock on the whole ghosts-in-the-attic bit, the forever residents of Sarah Winchester's rambling pile seem to be impressively dispersed throughout the home's many twisty, turny rooms. And why shouldn't they be? After all, it is, famously, one of the largest private homes anywhere. THE HALLOWEEN SEASON... thrums with a lot of potential ethereal action at the Winchester, what with the after-dark Flashlight Tours, so it seems like a fine moment to visit the attraction's roster of where ghosts have been seen by guests. 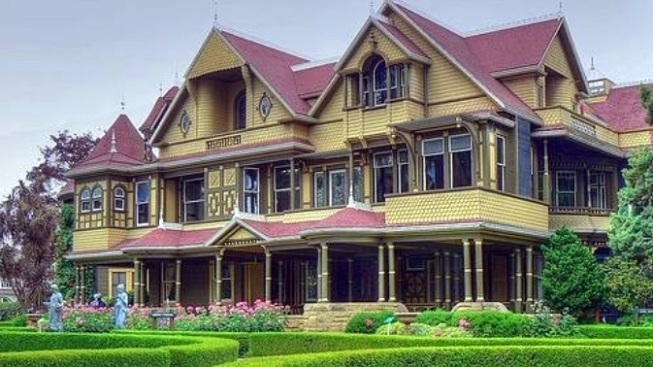 Thirteen accounts have been submitted of a ghost on the back steps -- that seems lucky, as Sarah Winchester had an affinity for the number -- and 28 ghosts have been spied in the Grand Ballroom. The South Conservatory isn't quite the happening haunt spot, with 2 sightings, but the Sarah Winchester bedroom and Seance Room boast dozens of sightings each. Have you felt or sensed something spooky in the house? Do you remember where? You can leave your tale on the web site, and perhaps see the numbers inch upwards for the Linen Room or Front Parlor. After all, no one ever said that vaporous beings had to strictly stick to the upper reaches of a home. Wraiths have a whole giant Victorian house to explore beyond the attic, and all of eternity to explore it.